Overlooking the picturesque backdrop of the Kandy Lake, the Kandyan Art Association rests on Sangaraja Mawatha, a brief walk away from the Temple of the Sacred Tooth Relic. Boasting 130 years of service, the Kandyan Art Association sustains and uplifts the standard of the lives of the craftsmen practising the Kandyan craftsmanship, hailing since the times of kings. The Association is housed within a building portraying the old-world charm, featuring lofty wooden roofs, bare brick walls and arched doorways. Its interior comprises two spacious halls displaying a plethora of arts and crafts of all sizes, colours and shapes imbued with timeless inspiration. Touring the trade stall gives one the mixed vibes of touring a museum with articles of antiquity and a gallery with alluring arts, leaving one awed and inspired with every step. The Kandyan Art Association is a trade hub that gathers the finest arts and crafts including silver, copper, brass, lacquer, casting works, wood works, handloom, hand embroidery as well as Dumbara mats woven with hemp (hana). These two halls sandwiched a corridor where its walls are adorned with portraits of eminent individuals as well as framed landmarks of the Association, and one of which is a portrait of Sir J.F. Dickson - the founder of the association. According to history, when the British took over the last kingdom of the country, the Kandyan artisans who were backed by the kings lost support to continue their livelihood. Thus Sir J.F. Dickson - the then Government Agent of Central Province - founded the Kandyan Art Association in 1882 to revive the fading craftsmanship and bring it back to its former glory. The Association was first housed within a 17th century building of the royal household, and in 1924 moved to the present building which used to be a military hospital during British rule. The next portrait was of then Minister of Foreign Affairs the late Lakshman Kadirgamar who funded Rs. 7 million as a government contribution to renovate the building. On the opposite walls were two more frames depicting a certificate and the pictures of the Kandyan crafts of the members, that were displayed at the renowned Exposition Universelle (World's Fair) held in Paris, France in 1900. The Kandyan Art Association is sponsored by the government and boasts 200 craftsmen as its members who are actively involved in continuing the traditional Kandyan craftsmanship for generations. The Association is managed by a committee appointed by the government and maintained under the supervision of the current Government Agent of Kandy District, who is also the President of the Kandyan Art Association. Apart from buying the crafts from the members and facilitating a trade stall in the premises, the Association also maintains a regular welfare fund for its members by saving ten percent of the value of goods they buy from each member in their respective accounts. Once a year if a member requires financial support, they can obtain up to 75% of the balance in their accounts. The trade stall not only attracts tourists but is also frequented by locals, as it is an ideal souvenir shop brimming with irresistible crafts. And the visitors, mostly tourists, are said to peak in January, August and December. A tour in the two halls will let you become lost amidst colourful lacquered pots, wooden sculptures and relief carvings, Dumbara mats depicting striking motifs, traditional drums, impressive Sesath, Olinda Kolombuwa (board of a traditional indoor game), cushion covers, sizable brass oil lamps, tiny brass and wooden elephants, brass and copper sculptures and ornamental items, handloom goods varying from wall hangers to handy bags as well as exquisite silver jewellery among many others. 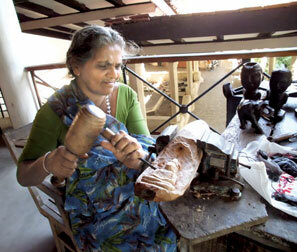 Those who visit the Kandyan Art Association can also witness craftsmen at work on site. They work in the breezy verandah unperturbed by the honking noises of vehicles passing by or the non-stop melody of ice cream vans parked nearby. Here I met the craftsman Sumanawickrama who comes from Ukuwela, Matale. He specialises in brass and silver work and has been working for nearly 20 years. He and his siblings are continuing the livelihood passed down from two generations. He was working on a brass jewellery box and even showed a unique crown shaped trinket box he made with intricate designs. One of the major issues they face is the cost of raw materials, since it has to be bought from outside sources. 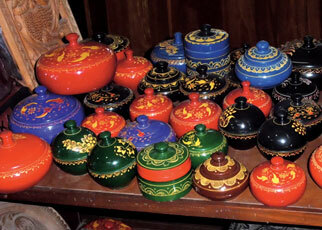 Every year the prices seem to rise, leaving the artisans with little choice to continue this perennial livelihood. Next, I met a cheerful craftswoman Winnie Margret Sooriyarachchi, of Kundasale and proudly claimed that she might be the very first craftswoman of Sri Lanka. Continuing the craftsmanship of her husband's generation she has been working for over 40 years and already boasts of numerous apprentices from various districts. 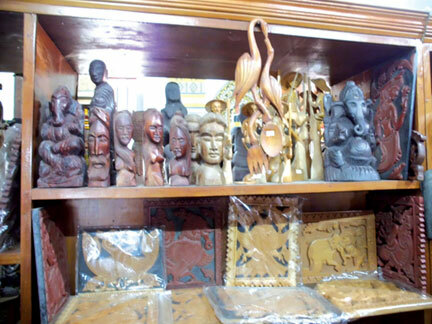 She specialises in wood carvings of all sizes and shapes, and I found some interesting articles lying on her table which includes a monk, fish and humongous toad, human figures with conspicuously big heads, book stand, mask as well as pendants, bracelets and key tags - all exclusively made of wood. She beautifully mingles the traditional art forms with her own innovative inspirations thus her creations have a unique appeal with a tinge of antiquity. Her children are already occupied with craft making and she too expressed that her only issue is the cost of raw materials, which they need to buy from outside sources. They were sincerely grateful to the Kandyan Art Association, which supports them with the sales of their precious handicrafts and offers financial support during difficult times. In addition to these two, on other days you can also find the lacquer and handloom craftsmen at work. Adjoining the building of the Association is its Cultural Hall with 1,000 seats where performers of Kandyan and low country dance schools organise their performances daily from 5.30pm. Tourists throng these events which include the spectacular Ves dances as well as the spine-chilling fire dances in addition to enchanting mask and cobra dances among others. Surrounded by the scenic backdrop of the Kandy Lake and swept constantly by its balmy breeze, the Kandyan Art Association continues to help the traditional craftsmen and inspire the world with an unparalleled craftsmanship that was adored continuously by the mighty kings in the days of yore.